A system and method for generating WSDL files based on MFS-based IMS applications includes receiving an IMS message byte stream and translating the byte stream to an MFS XML document. An MFS WSDL file is generated from the MFS XML document. The MFS WSDL file can be published at a UDDI directory. FIG. 7 is a block diagram of a system architecture. Referring initially to FIG. 1, the overall operating logic of the present invention is shown and commences at block  10 wherein an MFS XML adapter is provided. 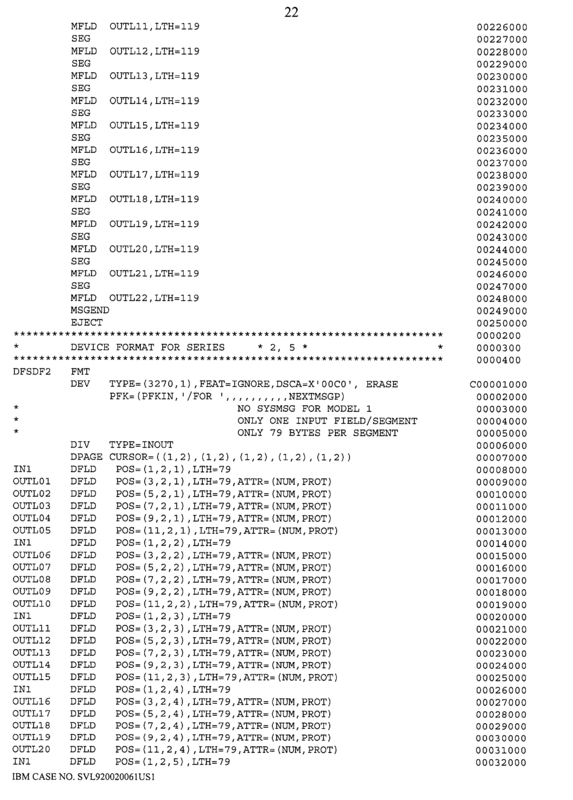 As described below, the MFS XML adapter includes a mapper which maps the XML document pertaining to the device information into the appropriate MFS XML messages (and vice versa). Also, the MFS XML adapter includes a converter that transforms the MFS XML messages into a byte stream and vice versa. The MFS mapper reads and parses MFS source files for a particular application and generates XMI files that describe the MFS-based application interface using the MFS Metamodel discussed in U.S. patent application Ser. No. 09/849,105 filed on May 4, 2001, incorporated herein by reference, which is part of the Common Application Metamodel (CAM) disclosed in U.S. Patent Application, serial No. 60/223,671 filed on Aug. 8, 2000, also incorporated herein by reference. Returning to FIG. 1, at block  12, the MFS XML adapter has access to an XML source repository and can properly invoke an MFS-based IMS application. It can be appreciated that the MFS-based IMS application contains corporate data, e.g., airline reservation data, rental car availability data, credit data, inventory data, news data, weather data, scheduling data, etc. Continuing to block 14, the MFS XML adapter is used to translate between IMS MFS messages and XML documents. The logic then ends at state 16. As described in greater detail below, the above logic allows a client program to access an MFS-based IMS application via the Internet. FIG. 2 shows the general translation logic utilized by the MFS XML adapter. 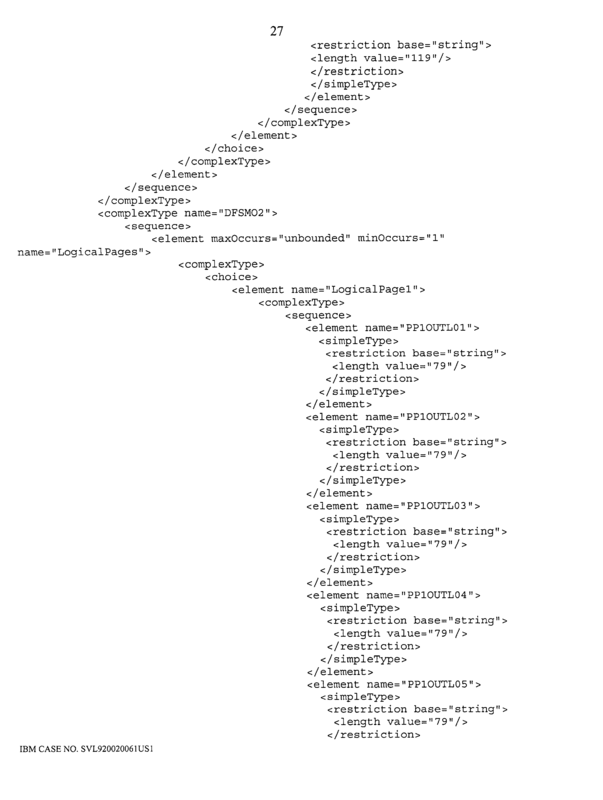 Beginning at block  20, a client request (or, a user request), e.g., an HTTP XML document or a SOAP XML document, is received at the MFS XML adapter. 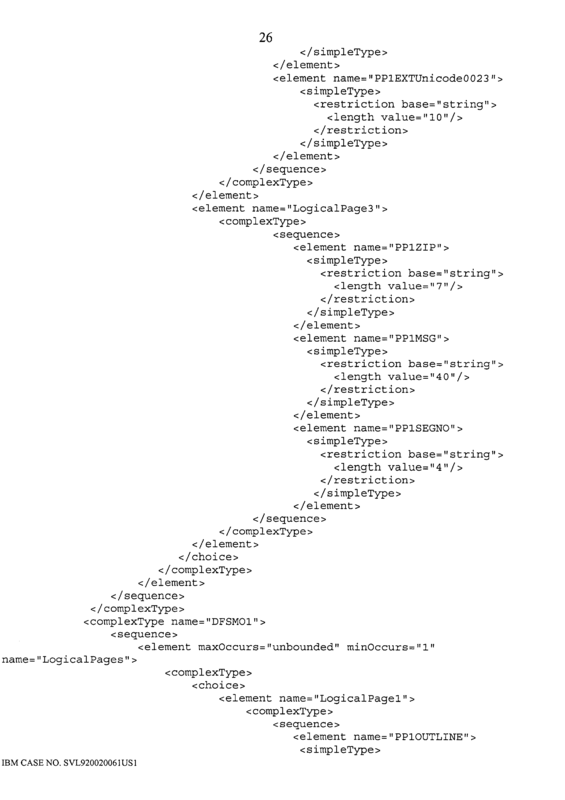 At block 22, the MFS XML adapter translates the client request to an IMS MFS message, the XML/MFS translation logic is described in greater detail below. Moving to block 24, the translated request is sent to the MFS-based IMS application. Next, at block 26, a response to the translated request is retrieved from the MFS-based IMS application. Continuing to block 28, the response is received at the MFS XML adapter. 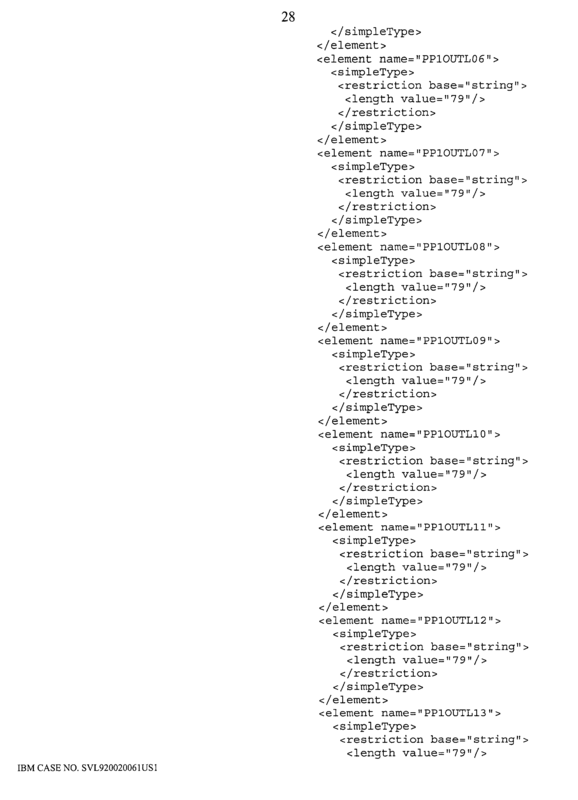 The response is translated, at block 30, from an IMS MFS message to the format of the client request, e.g., HTTP XML, SOAP XML, etc. Proceeding to block 32, the translated response is returned to the client program. The logic then ends at state 34. Referring now to FIG. 3, the XML/MFS translation logic is shown and commences at block  38, wherein a client request is received at a SOAP RPC router. Next, at block 40, a SOAP MFS Handler creates an MFS device XML document. At block 41, the SOAP MFS Handler calls the MFS XML adapter and sends the MFS device XML document to the MFS XML adapter. Proceeding to block 42, the MFS XML adapter loads in MFS MID XML files from an XMI repository to translate the device XML document to an MFS message XML document. Moving to block 44, the MFS XML adapter translates the MFS message XML document to an IMS message byte stream. Next, at block 46, the IMS message byte stream request is sent to the MFS-based IMS application. Continuing to block 48, an IMS message byte stream response is received by an MFS XML adapter. At block 50, the MFS adapter translates the IMS message byte stream to an MFS message XML document. Then, at block 52, the MFS XML adapter loads in MFS MOD XMI files from an XMI repository to translate the request to an MFS device XMI. Moving to block 54, the populated MFS XMI document is returned to the MFS servlet. At block 56, the SOAP MFS Handler converts the MFS device XML document to a name/value pair. Then, at block 57, the name/value pair, encapsulated as payload in a SOAP message, is returned to the client, e.g., to the client=s web browser. The logic then ends at state 58. Referring to FIG. 4, the WSDL generating logic is shown and commences at block  60 wherein host information, i.e., IMS information and namespace is preferably input by the client. It is to be understood that the IMS information can include: hostname, port number, datastore, and security information. At block 62, the name of the new operation is specified by the client. Moving to block 64, the client selects one or more MFS files and the MFS mapper loads them into memory. At block 66, existing resources are loaded into memory from an XMI repository. Each of the resources is a MID file or a MOD file. Moving to block 68, a MID file and one or more MOD files are selected. In a preferred embodiment, the client is prompted to selected a MID file, but an associated MOD file is selected automatically. Additional MOD files can also be selected. Continuing to decision diamond  70, it is determined whether the selected MID and MOD files are loaded and valid. If not, an error message is presented to the user, at block 72, and the logic returns to block 68 so that different MID and MOD files can be selected. If the selected MID and MOD files are loaded and valid, the logic moves to block 74 where the resources are filtered on the device type and the feature specification. Next, at block 76, the resources are serialized into MFS XMI files. Proceeding to block 78, MFS device information of the selected MID and MOD resources are transferred into XML schema definition (XSD) types based on the MFS to XSD mapping model, described below. Next, at block 80 the MFS XML adapter serializes the WSDL file and the SOAP MFS Handler for the MID and MOD files selected above. It is to be understood that SOAP MFS handler includes means for routing SOAP requests and responses and for invoking proper operation. Preferably, the SOAP MFS handler maps the name/value data from a standard SOAP handler, e.g., an reprouter, to simulated device input XMI which is sent as input to the MFS XML handler. The logic then ends at state 82. Referring now to FIG. 5, the web services invocation logic is shown and commences at block  100 where the WSDL file, generated above, is preferably located by the web services client. Next, at block 102, the web services client creates a SOAP message based on the WSDL and sends it to a SOAP RPC Router. The SOAP message created by the client has a payload that is all strings, with names matching the device field labels chosen from the device input field (DIF). 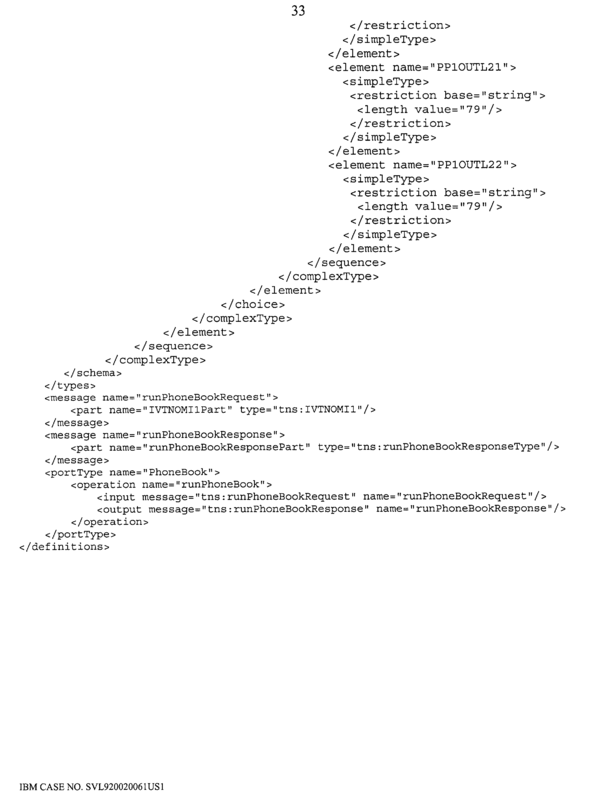 Moving to block 104, the SOAP XML document is received at the SOAP RPC router. At block 106, the SOAP MFS handler corresponding to the router is invoked with payload data from the SOAP XML document. Continuing to block 108, an XML document simulating the device input XMI is created by the SOAP MFS handler. 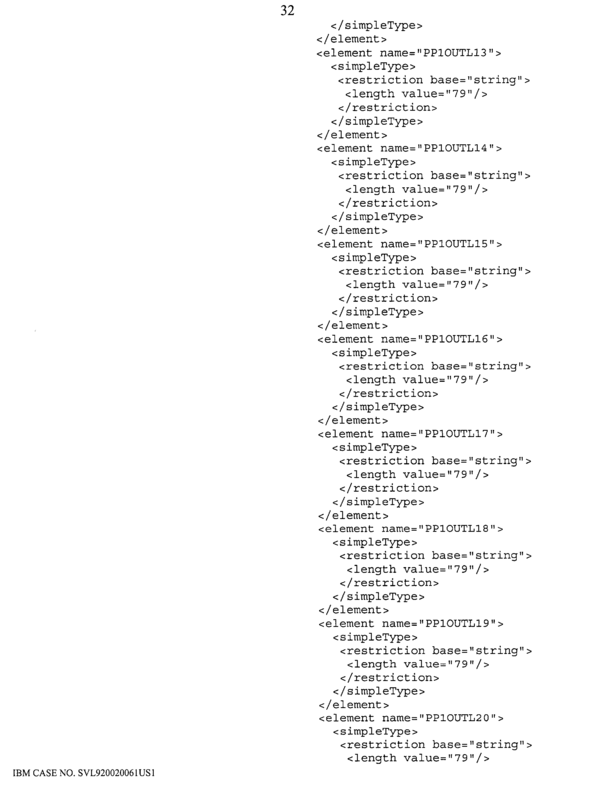 Then, at block 110, the XML document is sent to the MFS XML adapter. Proceeding to block  112, the MFS XML adapter translates client requests to byte stream based on meta-data information stored in the MID XMI file. Moving to block 114, the translated request is sent to the MFS-based IMS application. Next, at block 116, a response to the translated request is retrieved from the MFS-based IMS application. 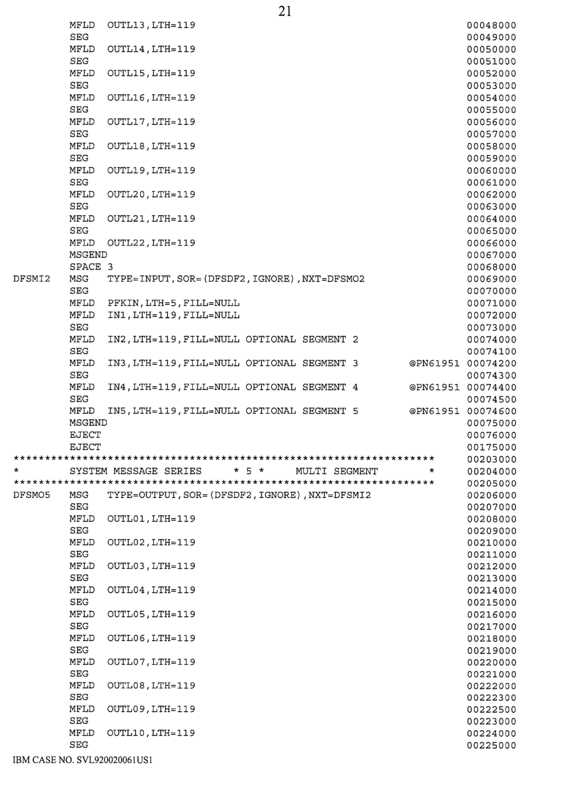 Continuing to block 118, the response is received at the MFS XML adapter. At block 120, the MFS XML adapter translates the IMS response to an MFS XMI message with the meta-data information stored in the MOD XMI file. Then, at block 122, the MFS XML adapter returns the MFS XMI message to the SOAP MFS handler. The SOAP MFS handler creates a SOAP message at block 124. At block 126, the SOAP message is sent to the SOAP RPC router. Proceeding to block 128, the SOAP message is returned to the client. The logic then ends at state 130. It to be understood that the mapping, described above, occurs on the following elements: MFSFormat, MFSDevicePage, and MFSDeviceField as shown in FIG. 6, which is an MFS to XSD mapping metamodel, generally designated  150. FIG. 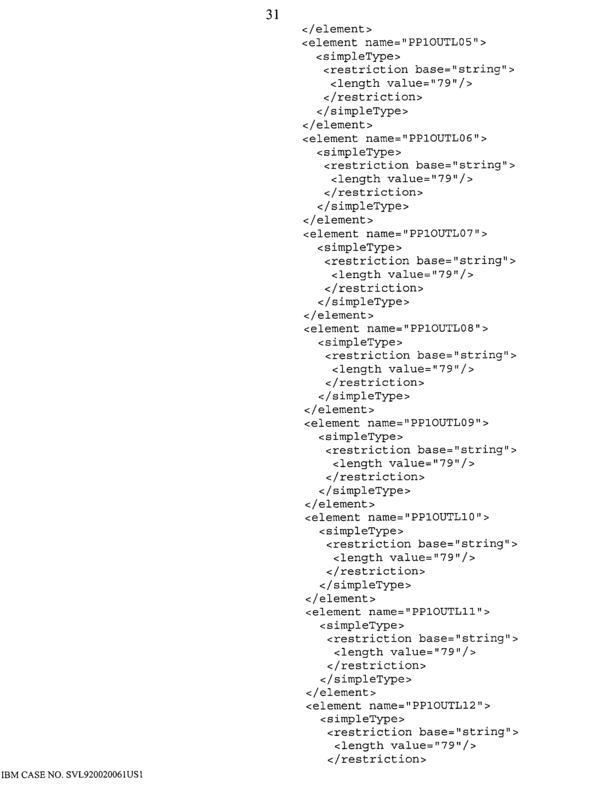 6 shows that MFSDeviceField 152 and MFSDevicePage 154 are mapped to XSDComplexTypeDefinitions 156. 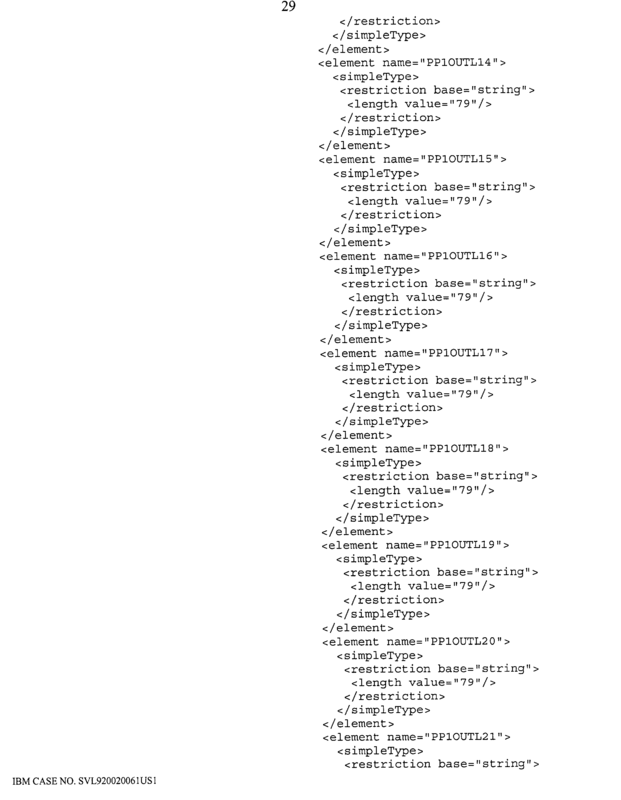 On the other hand, MFSFormat 158 is mapped into XSDSimpleTypeDefinition 160. It is to be understood that only the MFSDeviceFields that are referenced by an MFSMessageField are used. It is also to be understood that the MFSFormat  152 represents the MFS FMT statement. The FMT statement initiates and names a format definition that includes one or more device formats as represented by MFSDevice. Each device consists of 1 or 2 divisions as represented by MFSDivision. Each division consists of 1 or more device pages as represented by MFSDevicePage. The mapping from MFSFormat  152 to XSDComplexTypeDefinition 156 translates into a choice of logical pages for input and into a sequence of logical pages array for output. In the case of input, the element name reflects the logical page no in ascending order. In the case of output, the logical pages array has a size of 0 to unlimited as specified in the minOccurs and maxOccurs attributes. The logical pages array holds a choice of XSDComplexTypes, where each represents a logical pages with the element name reflecting the logical page no in ascending order. Further, the MFSDevicePage  154 represents the MFS DPAGE statement. It describes the grouping of a logical page of a device format. It consists of 1 or more physical pages (implicitly defined) and each physical page consists of 1 or more DFLDs. 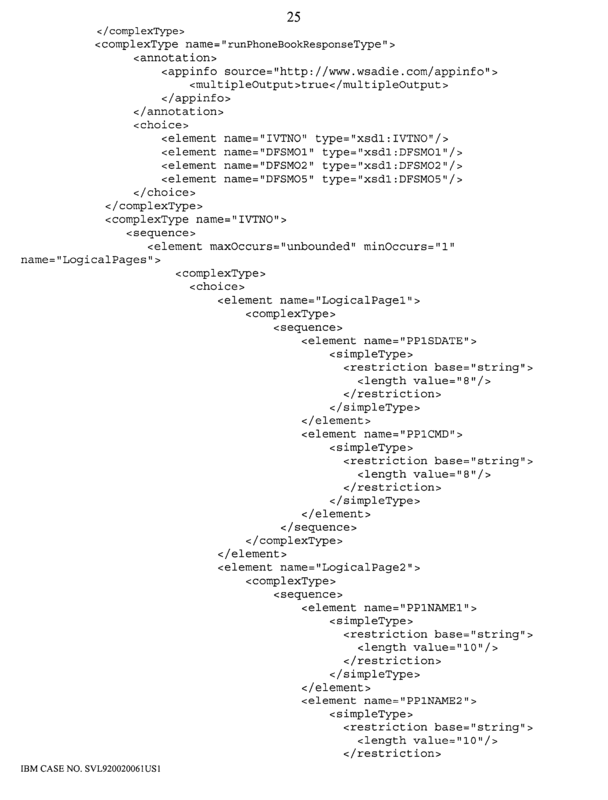 The mapping from MFSDevicePage 154 to XSDCompleTypeDefinition 156 translates into a sequence of field elements. Each field element, MFSDeviceField, is represented by XSDSimpleTypeDefinition. The element name reflects the physical page no and the name of the field. The order is in ascending order starting from physical page 1. The MFSDeviceField  158 represents the MFS DFLD statement. It defines a field within a device format which is read from or written to a terminal or remote program. The attributes in particular interest to XSD mapping are the length and value attributes. The mapping from MFSDeviceField 158 to XSDSimpleTypeDefinition 160 stands if and only if an MFSMessage (belonging to the same MFSDevicePage) has a reference to the device field. The device field=s name, length, and value attributes are mapped to the XSD element=s name, length value, and annotation tags. It is to be understood that XSDComplexTypeDefinition  156 is a XSD definition that contains sub-element, i.e. mixture of complex and simple types. 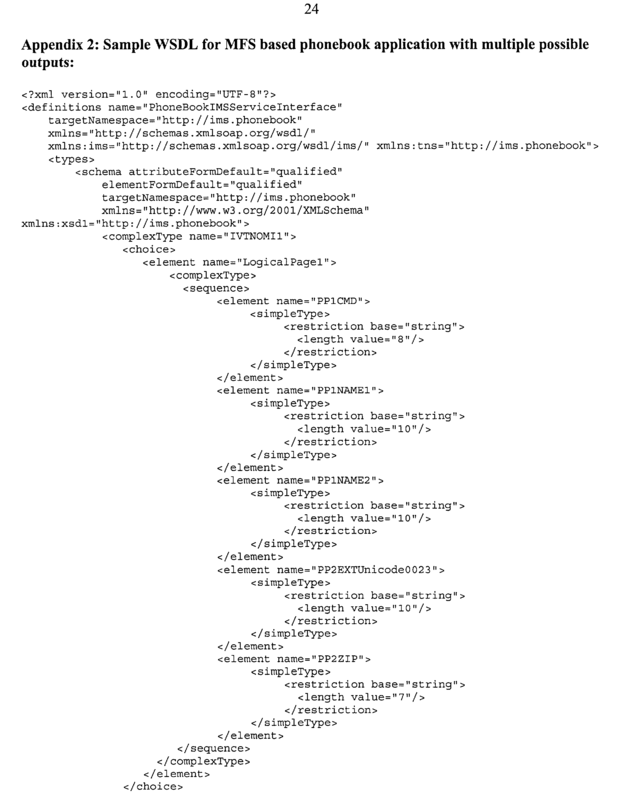 It can contain a set of element declarations, element references, and attribute declarations. The declarations are not themselves types, but rather an association between a name and the constraints which govern the appearance of that name in documents governed by the element. XSDComplexTypeDefinition 158 is also used to represent multiple possible outputs. It contains a choice of output elements, each of which is of XSDComplexType. The name and type of the subelement resolves the reference to the output definition. It is to be further understood that XSDSimpleTypeDefinition  160 is a XSD definition that is of simple data type, i.e. string, integer, etc. It can hold restriction to limit the data type and length value. For the purpose of MFS mapping, the XSD simple type is restricted to the base type String. An annotation tag is used to hold default values and data pattern for double byte character set (DBCS). Appendix 1 shows a non-limiting, exemplary MFS source file for a phonebook application. Also, Appendix 2, shows non-limiting, exemplary WSDL for an MFS based phonebook application having multiple possible outputs. FIG. 7 shows a system in which the above logic can be incorporated. For example, FIG. 7 shows a web application sphere (WAS) system, generally designated  200, in which SOAP compliant XML documents are utilized. As shown, the system 200 includes a first client computer 202 and a second client computer 204 that are connected to the Internet 206 by respective modems 208, 210. FIG. 7 shows that the Internet 206 provides a connection to a WAS 212. It is to be understood that at least one client program resides on the client computers 202, 204. Within the WAS  212, is a SOAP RPC Router 214 that receives SOAP compliant XML documents. The router 214 constructs a name/value pair from the SOAP compliant XML documents and sends them to a SOAP MFS handler 216. The SOAP MFS handler 216 sends a DEV XML document to an MFS XML adapter 218 in which the logic depicted in FIGS. 2 and 3 resides. As shown in FIG. 7, the MFS XML adapter 218 includes an MFS mapper 220 and an MFS converter 222. The MFS mapper 220 is connected to an MFS XMI database 224. In accordance with the translation logic, the MFS mapper 220 and the MFS converter 222 work together to translate the DEV XML documents into a byte stream that is sent to an IC4J 226. 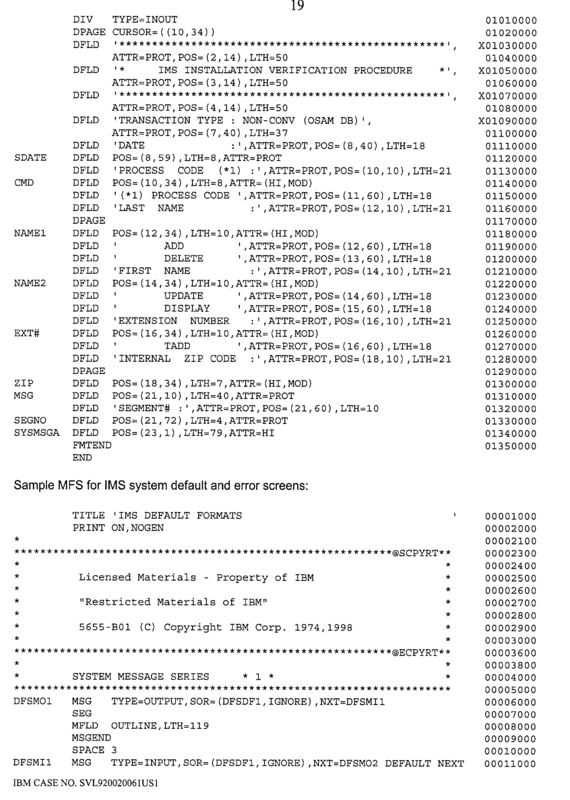 The IC4J 226 sends the byte stream to a mainframe 228, e.g., an IBM S/390. 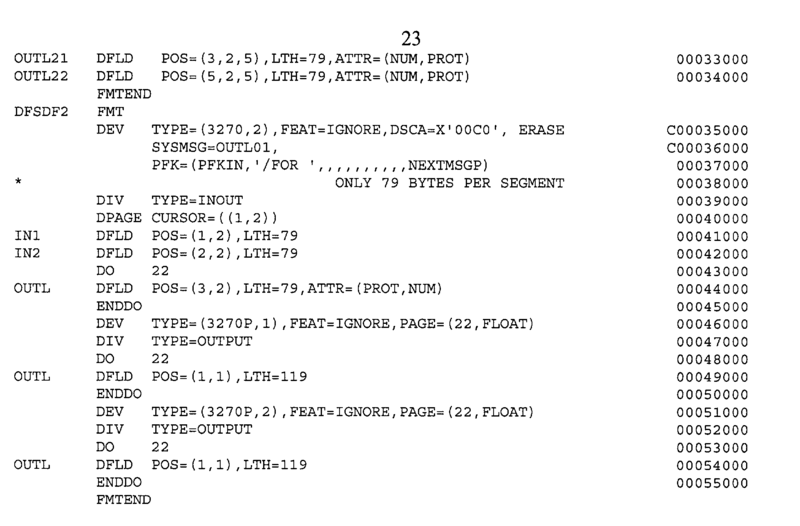 At the mainframe, the byte stream is received by IMS connect (IC) 230 which, in turn, sends the byte stream to an IMS application 232 within the mainframe 228. FIG. 7 shows that the IMS application 232 includes a control region 234 and a transactional application program 236. 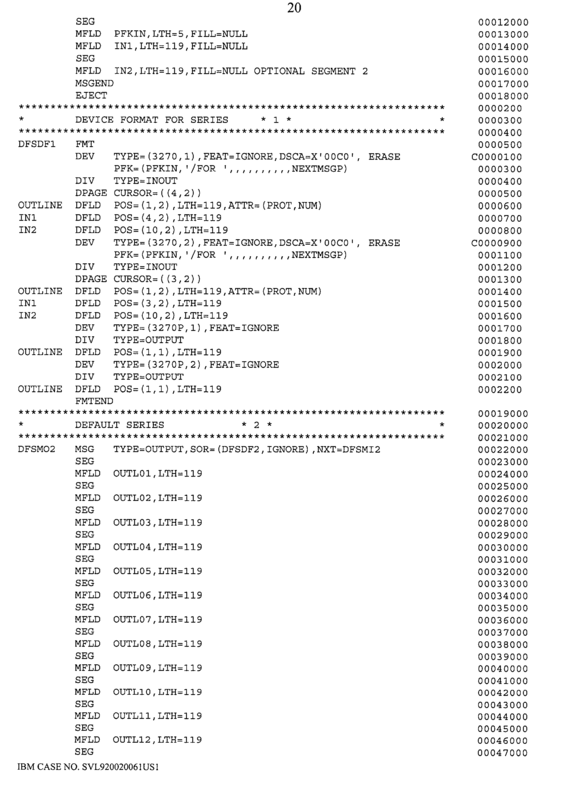 It is to be understood that, in the above described WAS system 200, the translation between XML and byte stream occurs within the MFS XML adapter 218 that resides in the WAS 212. It can be appreciated that in the exemplary system  200, described above, the client requests, e.g., HTTP XML documents or a SOAP XML documents, are received at an MFS XML adapter 218. The MFS XML adapter 218 converts the client requests into MFS-based IMS message byte streams and sends them to IMS applications 232 where they can be processed. The IMS application returns responses that are converted by the MFS XML adapter 218 back into HTTP XML documents or SOAP XML documents that can are rendered at one or more clients=web browsers. Thus, the MFS XML adapter 218 acts as a two-way translator to facilitate client interaction with IMS applications 232 via the Internet 206.
logic means for generating an MFS WSDL file from the MFS XML document. 2. The program of claim 2, wherein the IMS message byte stream is received via MFS. 3. The program of claim 2, wherein the IMS message byte stream is translated to the MFS XML document using an MFS XML adapter. logic means for publishing the MFS WSDL file with a UDDI directory. 6. 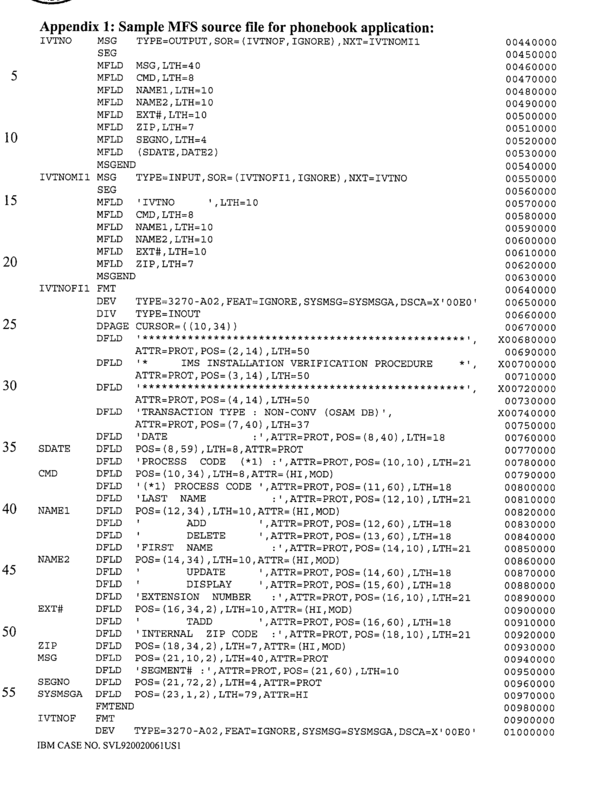 The program of claim 4, wherein the IMS message byte stream is received via MFS. 7. The program of claim 6, wherein the IMS message byte stream is translated to the MFS XML document using an MFS XML adapter. receiving at least one MFS WSDL file, the WSDL file being at least partially based on an MFS IMS source file. publishing the MFS WSDL file with a UDDI directory. 10. The method of claim 8, wherein the MFS WSDL file is generated based at least partially on an MFS XML document. 11. The method of claim 10, wherein the MFS XML document is translated from an IMS message byte stream. 12. The method of claim 11, wherein the IMS message byte stream is received via MFS. 13. The method of claim 12, wherein the IMS message byte stream is translated to the MFS XML document using an MFS XML adapter. generating an MFS WSDL file according to the MFS XML document. publishing the MFS WSDL file at a UDDI. 16. The method of claim 15, wherein the IMS message byte stream is received via MFS. 17. The method of claim 16, wherein the IMS message byte stream is translated to the XML document using an MFS XML adapter. 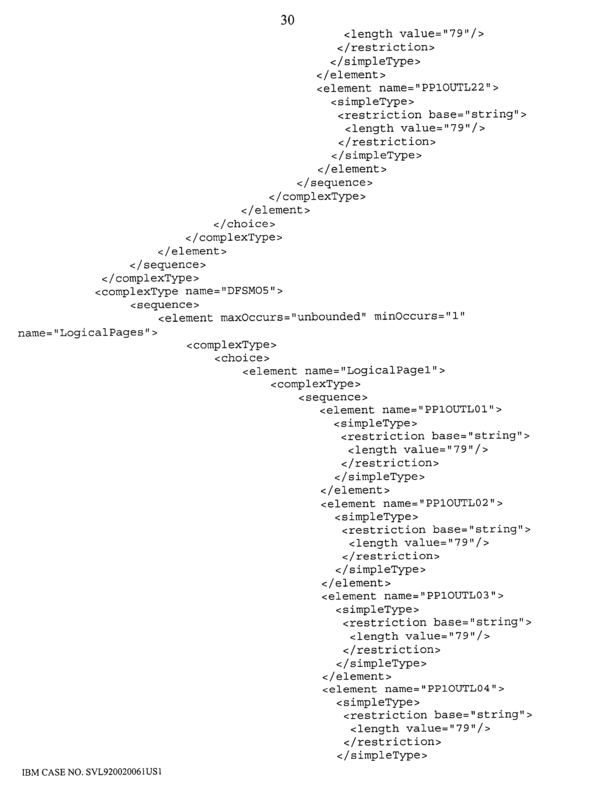 generating an MFS WSDL file from the XML. publishing the MFS WSDL file to a UDDI directory. 20. The method of claim 19, wherein the IMS message byte stream is received via MFS. 21. The method of claim 20, wherein the IMS message byte stream is translated to the XML document using an MFS XML adapter.